And we're back. I hope all of my US readers had a good holiday weekend. We start off Episode 037 with Claire being brought back into camp, and the discovery that she has amnesia and can't remember who anyone is or what happened to her. Ethan confronts Charlie and tells him he wants Claire back, or else he'll start killing some of the survivors. Everyone sets up camp at the caves and they decide to start posting guards at night, but Ethan comes in from the water and kills one of them. They decide to trap Ethan and use Claire as bait, while hiding with the guns from the Marshal's case. The plan works and Ethan is captured, but Charlie shoots and kills him. Next, we lighten things up with Sawyer having some problems with a wild boar, although he also hears the same voices that Sayid heard in the jungle. Charlie and Hurley bury Ethan's body, and Kate & Sawyer play a game of "I Never". 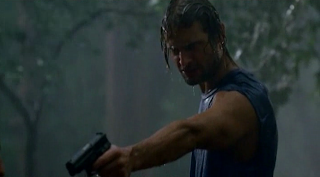 Sawyer eventually finds the boar, and they reach an "understanding". Michael continues to work on his boat, Claire and Charlie repair their relationship, and Jack and Sawyer have a heart-to-heart where Sawyer learns that he ran into Jack's father in Australia before he died. This episode runs 55:47 and is 452MB to download. You can stream below (via Facebook), or go here to use torrents (better quality, recommended) to download the episodes to your computer. Notice the rain again when Ethan dies. I guess the boar was supposed to be the smoke monster. I guess he was trying to prove that Sawyer hadn't changed. That he would kill the boar just like he killed the other guy. But he was wrong. Why is Sawyer's dream gone, I thought it was separate from the flashback and Claire's dream was shown. You know, that's an interesting point. I guess I hadn't thought about it that way when I was putting this together, but you're right, the scene when Sawyer's dad kills his mom and himself was definitely a dream, not a flashback. I guess if I was going to be consistent this would be the best place to put it. However, I would argue that the narrative is more effective with the dream being put in chronological order, as it's a complete scene, whereas Claire, for example, her memories are just bits and pieces and not whole thoughts. Still, that's a good catch, very observant of you.